High Performance Thermoplastic Manufacturing | Tri-Mack Custom Plastics Manufacturing Co.
At Tri-Mack, the quality of our components is of paramount importance. There simply can be no compromise since our parts are used in demanding aerospace, defense, medical, chemical processing and industrial equipment applications. At the component level, Tri-Mack’s quality system ensures that lot traceability, material certifications and approved vendor requirements are satisfied. Tri-Mack has the required quality tools, from CMMs for complex dimensional inspection to an Olympus ultrasonic tester for thermoplastic composite NDT at our Advanced Composites Center. 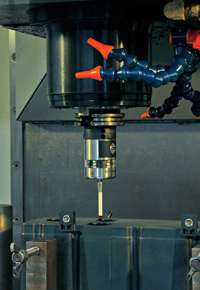 We also use in-machine probing to measure and collect dimensional data while the part is still fixtured in our CNC machining center. Processes are measured and monitored using Visual Quality software which runs with our MRP software, Visual Manufacturing. Tri-Mack is qualified to ship directly to stock for many of our customers and we have trained DSQRs (designated supplier quality representatives) on staff for many OEMs. As a company, Tri-Mack’s award-winning quality system governs everything we do and is woven into our corporate culture. Our entire organization is committed to meeting our customer’s quality requirements.